I discovered some great small "speaker" mobile options for travelers and mobile warriors at CES this year. Edifer offers a few options that are perfect for those on-the-go. Sound To Go PLUS is all about portability - they do an all-in-one micro speaker with re-chargeable Lithium battery. Encased in a brushed aluminum chassis, it features 2 channel stereo with 2 full range 1.25" drivers on each channel (magnetically shielded). It also features a built-in 'Class D' amplifier and a 3" x 1.25" oval passive radiator, which means someting to those in the audio world. An auxiliary input enables the use of multiple host devices such as smartphones and iPads. They tout their system as a self-contained portable mini-speaker system that delivers exceptional audio performance above and beyond in laptop or tablet speaker systems today. With smooth curves and a streamlined chassis, the fully portable MP15 by Edifier® is the perfect music companion for all locations. With an SD card, USB slot, MP3 player capability and a built-in rechargeable battery, music can be played for up to 6 hours. Small enough for any bag or pocket, the MP15 packs a punch for sound! Check them both out for fabulous sound on-the-go. CES kicked off this week with CES Unveiled, the official media event on January 6 at the Mandalay Bay in Las Vegas. HAPILABS, a company focused on well-being in every aspect, whether that is achieved through fitness, diet, your sleep or how you eat, showed off their new HAPIfork at the event. Their goal is to make it easy for people to take control of their HAPIness, health and fitness through applications and mobile connected devices. The world’s first connected fork that helps you lose weight by eating at the right time and at the right pace is also showing this new smart device at the Showstoppers media event on January 8 at the Las Vegas WYNN Hotel and all week at Digital Health at the Las Vegas Convention Center. The smart connected device, which has a crisp, elegant and clean design, was created by French engineer Jacques Lepine. The HAPIfork will be available in five colors when it hits the market this year: blue, green, white, black and pink. This smart fork knows how fast you’re eating and helps you slow things down using a patent-pending technology. By eating slower, you can improve the way you feel after every meal, enhance your digestion and reduce your weight. When you are eating too fast, HAPIfork sends you gentle vibrations and indicator lights so you are aware of when you’re not eating at a pace that is optimal for your health, allowing you to slow down without a disruption to your meal or conversation. All of your HAPIfork eating data is transmitted to your online account when you connect your HAPIfork to your computer via USB or your smart phone via Bluetooth. This flexibility means you can monitor your health improvement at home or on the road from a mobile device. You can choose to keep this information private or share some or all of this data with friends who are supporting you, your health and lifestyle. The complete suite, which will be priced at $99, will include the HAPIfork Device, an Online Dashboard, which stores and reviews your eating-related data and helps you track your progress meal after meal, a Mobile App which allows you to follow your stats from your mobile device, a Online Coaching Program for tips and tricks on eating smarter and healthier, and an Online Social Game, designed to motivate you to implement your new habits with your loved ones. Below, HAPILABS CEO Fabrice Boutain shows a HAPIfork and HAPItrack prototypes in Paris this past December. Disclosure: I am a consultant for the company. My laptop is dying a slow horrible death. The fan is howling and all sorts of unknown noises are coming from in its hardware interior. It's a Lenovo, my second over an eight year period. We all knew the day was coming. “We” is anyone and everyone who has stopped by my office or seen me using it at an event. They'd hover over me and remark: I can’t believe how slow your machine is, yowsa – how do you get anything done? The thing is…I've only had it for four years and it's been on its way out for half of those four. It seems as if I grew up in a world with different standards. The thought of a piece of machinery you paid $2,500 for with all the bells and whistles dying within a few years wouldn’t be acceptable…it’s absurd and yet we've all been brainwashed into thinking it’s not. Manufacturers and reviewers alike are both to blame for creating such a consumable world where we're constantly shelling out more money for more reliable hardware, which it should have been reliable in the first place. My refrigerator didn't cost that much nor did the stove in my kitchen and yet both have been purring along for more than a decade. I paid $300 for a car once that lasted longer than my laptops do today and it’s likely that some old guy somewhere in Maine probably is still using it for trips to the grocery store. When someone sees my two year old iPhone, they look at me as if I'm as outdated as the guy who’s driving that old Oldsmobile. A few friends are trying to get me to upgrade my four year old 24 inch Samsung flat screen monitor when it works perfectly fine. Call it old fashioned wisdom of sorts, or just common sense, but who said, "if it works, don't mess with it?" Oh yeah, that was my grandfather, not Winston Churchill or Steve Jobs. When I ask "why upgrade?" I'm told there's better pixels, faster speeds or I’m bound to have compatibility issues. While Windows 8 is now available, consumers are forced to pay an extra $100 for Windows 7, now outdated. It's the exponential growth thing haunting my every day, the pressure of keeping up with the speed at which technology is accelerating not to mention the pressure we all have financially of trying to keep up with it all too. Silicon Valley tells me to ‘get over it,’ and just upgrade, but Silicon Valley doesn’t live in the real world where salaries are one fifth of what they are elsewhere in the country and that’s if you aren’t one of the 20 something year olds who made an exit from a not so innovative of an app that got sold to someone with more money than brains. eMarketer made a 2012 tablet sales prediction of 81.3 million tablets, up from 15.7 million in 2011, and Gartner estimates that sales will multiply to 54.8 million in 2011 and more than 208 million by 2014. Forrester Research numbers have laptop sales continuing to grow from 26.4 million in 2010 to 38.9 million in 2015, however, while desktop PC sales will decline from 20.5 million in 2010 to 18.2 million in 2015. Mobile is hot and we’re all moving to smaller form factors – the trends make sense. Take a look at research firm Canalys figures: they have vendor shipments of smartphones close to 489 million smartphones in 2011, compared to 415 million PCs. Smartphone shipments increased by 63% over the previous year, compared to 15% growth in PC shipments. While mobile will win at the end of the day, the need for laptops and in some cases desktops isn’t going away tomorrow, although some will argue they can do nearly everything they need to on their iPad. While I use one, particularly when I travel, my efficiency on the thing is less than half what it is on a power laptop, even my poor dying Lenovo. While many of my laptops over a decade have died a slow horrible death, some of them still turn on…..they’re just not usable. As I took a hardware account, I was shocked by the list, although I suppose I shouldn’t have been! Two HPs, a mini HP, a baby MSI wind notebook I bought for a trip to Africa, a Toshiba, an Acer, two IBM/Lenovos and a partridge in a pear tree. The power chords are out of control because none of them are compatible with each other, even the ones made by the same manufacturer. The result? A digital me and a digital life that doesn’t make things more efficient and yet productivity is the #1 thing I need these devices to deliver me and my business. The advancements in the last decade are remarkable. For those who argue that the Singularity isn’t on its way, they might want to pause and reflect on just how fast things are moving and that it’s more difficult than ever to keep up with the advancements being thrown our way. Clearly I'm not a luddite and I love shiny new cool gadgets and toys as much as much as my fellow geeks; remember that next week I'm off to CES for the umpteenth year in a row. Yet, we need to remind ourselves that technology is an enabler; it needs to enhance our lives not be a hindrance to a more fulfilling life. Dealing with technology glitches, whether that be hardware or software, is something I deal with daily and these issues increase in less than a year after purchasing a brand new laptop. Shouldn’t we demand more from the hardware manufacturers? That said, the decision is final. I finally made the plunge and as I write, there’s a Mac Book Pro on its way to me directly from Apple. While there’s no question, I’m a power user, I decided not to order the ‘very top of the line’ since it offers more than I’ll need. Did I mention that the price is nearly double what I’d pay to get the ‘same specs’ in a Lenovo or an equivalent? Additionally, these beautifully designed machines are heavy, roughly 30% heavier than had I gone for the latest Lenovo or Toshiba. While I’m eager to start my 'simpler technology life,' I have my doubts. For the Apple fan boys who claim Macs are perfect and problem-free, I’d love to know why I own five iPods and only two of them actually work. My iPhone hasn’t given me any issues so far nor has my iPad, but I haven’t put it through the ringer by loading hundreds of apps like I need to do on my laptop. While many of you may be okay with upgrading every piece of hardware we own every two years, should you be? How thin do we need our phones to be? How many apps do we really need? How many pixels do we need? How much memory do we really need? If I hear one more person insisting that I spend an additional $500 for a solid state drive, I’m going to scream. These are the same people who will insist I upgrade to an even faster solid state drive in a year and spend $500 again. For the new MacBook Pro with Retina Display, it's the screen -- all 2880 x 1800 pixels of it -- that will leave others scrambling to play catch-up. Of course, to push that many pixels you need serious horsepower. And the next-gen MacBook Pro (starting at $2,199) delivers just that with a quad-core Core i7 processor, Nvidia Kepler graphics and super-fast flash memory. Did we mention the MacBook Pro is only 4.5 pounds and is nearly as thin as the Air? Manufacturers stick together, use glossy language to woo us in and build in the same obsolescence. When the industry and consumers comply, no one can complain since they all seem to die a slow horrible death much faster than they should given how much we spend. (see blog post entitled the iPad Mini: Why Apple Thinks You're an Idiot). But alas, a dozen blog posts from now, I’ll be on a new machine, a Mac Book Pro, and hopefully in some magical way, my technology life will be transformed for the additional $800 I'm spending. While I’m looking forward to what the Mac Book Pro will deliver, sometimes I want to just toss all of it into the ocean, or give a little pain back to the hardware that has cost me so much value time over the years, not that I’ll ever have the courage of course. That said, it appears not everyone shares my constraint. Also refer to two posts I wrote a year or so ago on digital personas and digital 'silence.' Here's a blog post on social media turning you into a low confidence anxiety-rich freak. Photo credits in order of appearance: A mashup created with Webdoc, Scott Kline, CoolGizmotoys. inTooch, a mobile application that supports both Android and iPhone, easily and seamlessly allows you to instantly exchange contact and social network information on the fly. inTooch teamed up with San Francisco-based Mobile-Loco this past week, an event that explores the convergence of brands, advertising and mobile. Attendees were encouraged to download the free mobile app, so they could quickly exchange all their contact information or a portion of it with new people they met at the event, including their social media network data. Whenever you meet someone you want to stay in touch with, you simply call the person, the app detects that you have called them for the first time and prompts you automatically to exchange your contact information, giving you the option to exchange your Twitter, Facebook and LinkedIn details as well. Since geo-tagging is built in, the inTooch app tracks where connection requests are made and will link all connection requests to the location, in this case the Mobile-Loco event in San Francisco, CA. When users browse through their connections, they can see all the connections they made at Mobile-Loco. After the event, inTooch will also send an email to each user who sent a connection request during Mobile-Loco with the list of all the contacts they met at the event, resulting in a more efficient way to follow up and turn contacts into relationships that matter. A useful augmented reality feature, which is popular for personal encounters, is a report that informs you of all the things you have in common with that person (friends, places you visited, music, movies you like, social network info, check-ins, interests you share). Unlike most apps, inTooch works regardless of whether the person you just met has it on his or her cell phone, making it the most natural, straight forward and easy way to share your personal or business details. inTooch is available for download at http://www.intooch.com and is free for users. Currently, inTooch works with both the Android and the iPhone, with support for other platforms and mobile devices coming later this year. Photo above is of inTooch's CEO Julien Salanon on the MobileLoco stage. Disclosure: I provide some consulting to inTooch. LeWeb Paris continues to grow year after year, with this year reaching over 3,500 attendees. From a couple of hundred attendees in the first year, they had 5,000 attendees this past year alone for both their London and Paris events, London being a test, something that they plan to continue doing in the years ahead. They attract big players like Orange, Microsoft and others and mid-tier players known in Europe and beyond, like Parrot, as well as tons of start-ups eager secure funding and entrepreneurs looking for the next big thing. It's also an incredible place to "schmooze" on the floor at the event itself as well as the umpteen after parties and events they hold in the evenings throughout the center of Paris. I returned to San Francisco from an exhausting trip of meetings and pow-wows to hear that LeWeb was acquired by Reed MIDEM, one of the leading events organizers in the world. How that changes the format of LeWeb moving forward is yet to be seen, but more budget and marketing should 'in theory' lead to more "high-touch" events, better food and higher profile speakers. That said, it could also drive ticket prices up. Acquisition aside, Loic and Geraldine LeMeur managed to pull off yet another fabulous event, from A-list speakers to entertainment and networking. So, who showed up there and unveiled their latest? Parrot's CEO Henri Seydoux, who I had an opportunity to meet several years ago when they hosted the TravelingGeeks trip I organized to Paris, was as charming as ever on the LeWeb stage in an interview with Loic LeMeur. Within LeWeb's theme of the "Internet of Things," he made what could have been a 'faux pas' by saying that you can't reference women as things or you'll be in trouble for a long time. It didn't turn into a faux pas though at least from what I could tell, since everyone laughed -- including women. I happen to like their products and team. As an aside, rumor has it that his actress daughter played a role in the latest James Bond film. Ahh yes, the things you learn at LeWeb. Chris Shipley ran the start-up event; the finalists were: Be-Bound, Qunb and Recommend. Be-Bound gives you access to the Internet without wifi, aka stay connected to the web without the Web. A stat for the taking: 3G/WIFI = 14% and 2G = 86%. These guys use the SMS layer. Their business model is using prepaid credits called B-Miles. For example, 3 Euros = 35 Be-Miles, 10E = 200 Be-Miles and so on. They'll also use advertising and couponing to drive revenue. Qunb's platform is all about quantitative data. The idea is you can now visualize and broadcast your own data! How it works: their platform understands your data semantically so your data becomes compatible with other data so they can make sense of each other. They’re going after large corporations who are willing to understand their data and compare it so it makes sense in a meaningful way. Currently, their product is featured on the SAP marketplace. The last finalist was Recommend, which is a platform that gives you recommendations from people you trust. There seems to be a lot of 'recommendation engines' out there, so I thought this one had the least potential from running a sustainable business in the long run vis a vis the others. Then, Team Blacksheep gave a demo - well sort of. A flying plane was let loose in the LeWeb audience. The TBS DISCOVERY frame is an upgrade for all Flamewheel F450 frames, using F450 arms and a custom TBS top and bottom plate including power distribution board. It's cool to watch and for geeks who are interested in this, apparently easy to build. I thought that Netatmo's concept was interesting - they're offering a personal weather station for the iPod and iPad, where you can monitor weather and air quality. Says the team, "we spend 80 percent inside - our lifestyle is indoor and we have to think about indoor air quality as well as outdoor air quality." They have created a weather station to monitor inside and outdoor environments and then they send this data to the cloud. The team showed real time data across a map of Paris where we could see weather patterns across different sections of the city. They take measurements of environment and are using crowdsourcing to bring this data to people in a way that is usable and "useful." They think that real estate prices will rely on data like this and can impact prices and other things. The more co2 you have, the more dense your space is, which decreases the quality of your air. Then, MG Siegler interviewed Instagram's Kevin Systrom, who's always at his polished best. I saw him a few months back in a similar "question exchange" with Sarah Lacy at one of her PandoDaily events in San Francisco. Stephanie Hospital and team at Orange hosted a power girls networking bash one afternoon, which I ironically went to with Yossi Vardi, most definitely not a woman. While it was indeed mostly women, a few male stragglers were there including French photographer Olivier Ezratty who is working on a photo exhibition of powerful women in the digital age. I'll share the latest as his work progresses. He also does a wonderful round-up of LeWeb every year, so check out his coverage here. Speaking of Yossi, he gave a talk on things start-ups need to think about and tips of the trade. He says, "Pivoting is important because of the feedback you receive along the way, however doing more than 2 pivots is bad." Additionally, he encouraged young entrepreneurs to network more often, always look for ways to provide value, and to try to find a funder from a mutual contact (someone you trust and someone the funder is likely to trust). He says of investors, "they need assurances and recommendations from people they trust." His main source of deal flow is through friends with credibility. On exits, he says there's a big debate in Israel at the moment about whether early exits are good. Pros and cons, he notes. Having an early exit leaves a lot of value on the table but if you want a bigger exit, later...you obviously increase the risk because it will take more time. I also ran into Stephanie Czerny who is one force behind the DLD Conference, held every year in Munich Germany. If you haven't been, you MUST - I keep meaning to return it was so good, if only January didn't present so many deadlines. I love these guys! Not only is the content and networking top notch, but their hearts are in the right place -- they're doing great things for the industry and world. In the main room, we then moved into physical objects, you know, real tangible products you can feel. The team from Sphero gave a demo on stage of their robotic ball, which has mechanics and two way wireless communication. They're using 6 axis IMu (essentially a navigation system) so they know where Sphero is going. Think of it as a robotics gaming system. They said on stage, "We think there's a continuum where games live inside augmented reality and we're trying to mash and bridge the virtual and the real." He adds, "a system of this nature requires strong computational power and you have to build interfaces in virtual and physical world." Ubooly also wants to bridge this world, but for kids aged 4-9. 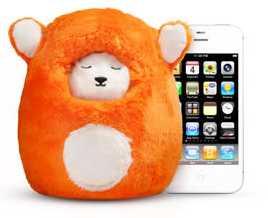 CEO Carly Gloge was on the LeWeb stage showing a stuffed animal that comes to life when an iPhone is stuck inside it using voice recognition. The "toy" suggests games to the kids in real time and gives feedback on their participation based on the phone’s accelerometer. Price point is cheap and perhaps one of the reasons, it seemed to receive positive feedback. Current going price is around $29.95. Lockitron also got quite a bit of buzz at the event and apparently others think its cool too - they've already placed some $2.2 million in pre-orders for the device. The device is a smartphone=controlled keyless door lock. You can reserve one with a shipping date of late May 2013 for $179. I hung out with the HAPILABS guys who were showing off their HAPIfork, which will be unveiled at CES next month. The HAPIfork is an electronic fork that monitors your eating habits, giving you precise information about your eating schedule and alerting you with the help of indicator lights and a gentle vibration when you are eating too fast. Below is CEO Fabrice Boutain showing off their first prototype. The other cool thing I saw was Australian-based LIFX, a revolutionary new lightbulb that takes something that we all use in our homes, and makes it smarter and more efficient. It was launched on Kickstarter, where they raised over $1.3 million. The LIFX lightbulb is a WiFi enabled, multi-color, energy efficient LED light bulb that you control with your iPhone or Android. How cool is that? See the below video to learn more. I had an opportunity to meet and chat with the founder of San Francisco-based ReAllocate, who is not about launching a new social media apps or anything that will connect things to the Internet or the Internet to things. ReAllocate is a global network of engineers, designers and entrepreneurs empowering under served communities through technology and innovation to improve quality of life. I love what they're doing! They call themselves "ReAllocators" and they engage in digital storytelling to inspire participation, promote collaboration, and raise awareness about humanitarian causes. I hope to visit them state-side. They supports three program areas that intertwine to create an infrastructure that supports sustainable development through education, ecosystems, equality, and economics. Learn a little bit more about what they're doing in Alaska and in Japan. I also had fun hanging out with the UK Trade & Investment folks as well. Did I mention all the after events? It's no wonder everyone who ventures to Paris every December for LeWeb is so happily wiped out at the end of it - fois gras, French bordeaux, dark chocolate, crepes, fabulous coffee and more. In traditional Loic and Geraldine style, they managed to nail a top notch act for the speaker dinner. Four girls in an act called ESCALA wowed the crowd with their violins and energy. See my write-up on them in We Blog the World's Music Section. The Dublin guys also did a meet-up at a place called Delaville Cafe on Boulevard de Bonne Nouvelle. It's a place my Paris buds didn't know about, but the ambiance was great, especially for group gatherings. They too do great things for the industry between their Founders event, Dublin Web Summit and other initiatives. And, I have to admit, like the French, I have a soft spot for the Irish and I love Dublin. Yet another successful LeWeb, an event I look forward to every December. Loic and Geraldine know how to curate an incredibly bright group of people who are working on things that will help shape technology as we know it and as a result, life as we know it. I love the initiatives coming out of Europe and LeWeb is the best place in Europe for that global conversation that bridges what's happening on the continent and the rest of the world!! For hoots, check out my review on UBER's launch at LeWeb (aka in Paris) last year, my LeWeb round-up from 2010, as well as a fun post from 2006 praising the food, suggesting that American conference organizers could learn a lot from their French counterparts. For general blog posts on Paris, check out We Blog the World's Paris page. All photo credits: Renee Blodgett. For all things mobile, mark your calendar for December 11, 2012 in San Francisco. The upcoming Mobile-Loco conference will be held at Mission Bay Conference and we have been offered a special Magic Sauce Media discount for Down the Avenue and We Blog the World readers. Mobile-Loco will dive into the brand, advertiser and mobile convergence in the context of the Social, Local and Mobile (SoLoMo) marketplace — exploring what this convergence means for big brands, consumers, SMBs and the mobile and location industry. Executives from Foursquare, Google, Airbnb, Groupon and other leading brands and investors will address these topics and discuss where the market is heading. Learn from brands how they are taking advantage of today’s new technologies and solutions to build durable brand engagement, relationships and presence in a chaotic and noisy marketplace. It's not news that if you're not on mobile or have an integrated mobile strategy, you'll be left behind quickly. Apps in this space are enabling hyper-local and real-time personalization, rich content and engagement, and ultimately more bricks-and-mortar transactions. At Mobile Loco, you'll learn from the leading developers and enablers in this space. Click here to register and receive a 25% discount off current registration rates. Don't Die a Slow Death in a Mountain of Business Cards: Try inTooch! I no longer get pumped up about cool new social apps or drink the Silicon Valley coolaid - there's just too much of it. When I learn about new products or services, these are my two go to questions: would I use this today and does this solve a real problem that I've had for awhile? When inTooch co-founder and CEO Julien Salanon gave me his pitch and suggested we work together, I was at first skeptical about their promise: to eliminate the business card problem. While it's too early to tell since there are so many variables in this business not to mention human behavior, as a fellow entrepreneur, I couldn't help but be intrigued by his idea. And besides, Julien has one of those personalities that is impossible not to like. He shared a story with me as we sipped tea at one of my favorite haunts in San Francisco's SOMA. Nearly ten years ago, he was at an important conference and forgot his business cards and a result, important connections were lost. Over the last decade, he said that he tried several apps to solve this business-card issue, but none of them worked. They still don't. Don't even get me started with BUMP btw, an app that peer pressure forced me to download yet it only worked one out of ten times I tried it. And, frankly, the whole concept of crashing two phones together doesn't quite gel with me. While I may not call every person I meet at a conference, when I do meet someone I want to stay in touch with and we don't have a pen or card, what happens? They call me so the number is saved in my phone. What I don't have in that scenario of course is their name or email automatically, but it's a process that works in a pinch. inTooch takes it a step further allowing you to email or call them on the fly which automatically sends a link: this link is the conduit which allows that exchange of information to happen. The beautiful part about the app and why it stands a strong chance of taking off, is that both parties don't need to have the app to work. Intrigued that perhaps I'd soon have a client with a product I'd ACTUALLY USE, I decided to be the evil dragonness to avoid any surprises later on, so I started drilling him with questions. What about categorization I asked? Not in the first version he said, but it's coming. What about social networks? Built in he said. What about privacy and personalization? Built in he said. Hmm, I wanted categories of course given that I have nearly 100,000 contacts in my database, but also realize that I'm not your average Nelly when it comes to contact management. As my friend Steve said, "you're not normal, you're in the business of needing to mate with the world. In fact, you love to mate with the world." I had to laugh. He's right. I love meeting people and no one seems to come home from an event with more business cards than I do. AND, he said, the ability to add contacts to categories is coming. They already have the ability to separate personal and business contacts. I'm a realist. Anyone who works with early start-ups needs to be a realist. Rome wasn't build in a day and most apps when they first go to market don't have every single detail or feature you want built in in their first version. As long as the team has it on the roadmap or thinking about it, it's good enough to give it a shot. If we didn't trust that process, real innovation wouldn't happen and we wouldn't be where we are today. Unlike so many social apps that are Web 2.0 features rather than solutions to problems, I thought to myself, "inTooch would actually take care of a huge pain point in my life." And so, we embarked on a journey in early September. Forward wind the clock. Julien took People's Choice Award at GigaOm's Mobilize in mid-September when he pitched a panel of VCs on stage. Then, he officially launched inTooch on the DEMO Stage on October 3 with Dave Mathews in an amusing skit that included the duo tossing 2,000 business cards into the DEMO audience as they shouted FREEDOM, FREEDOM, FREEDOM. At one point, I thought Julien might start dancing when the music came on. OR, maybe it was one of those Halleluja moments. Consider this: did you realize that of all the people you meet at a conference or even in a personal situation, you won't stay in touch with 85% of them? Without sounding too trite - inTooch to the rescue. Trust me, I want to be rescued and I think most of us do. I can't keep up with the volume of contacts and there are always people to want to follow up with and just don't have the time. There are also people's contact information I'm trying to locate months later and realized I didn't have time to enter their data. 1. The Mobile Geo-Location Piece: since I travel a lot, I often think about people (and their faces) based on 'where' I met them. Oh yeah, that was John who I met at this festival in Louisville Kentucky, or that was Jeannie something and we hung out at CES in Las Vegas. Using geo-tagging, inTooch lets you search for people by location and their photo appears as well to jog your memory. Sweet! 2. Seamless/Fast: additionally, if I don't want to call the person or they don't want me to, I can shoot them an email and the inTooch connector still works. The other cool thing is that both parties don't need the app for the exchange to happen. Obviously the process is even faster if both people DO have the app, so I'd encourage everyone to download the app. Let the seamless exchange of data begin! 3. Social Network Exchange. So many people I meet under the age of 30 either don't have a business card (even in a business setting), give me their Twitter handle or say connect with me on Facebook. (as if I'm going to remember their name or handle the next day or a week later when I'm back home). I'm always amazed that they think I'll take the time to jot down their data with a visual queue of our conversation. It's too much work. What's great about inTooch is that you can opt to include the exchange of your social network information as well. It currently supports LinkedIn, Facebook and Twitter. I've known Chris Taylor from Mashable for years and for some odd reason, didn't know he was @FutureBoy on Twitter. Ever try to Google a "common name's" Twitter handle and not get so frustrated by the fifth click that you finally give up? Don't get me started on the poor search functionality within Twitter itself although I know they're improving it all the time. 4. Augmented Reality: for personal encounters, inTooch brings augmented reality to your connections, alerting you to all the things you have in common with another person (friends, places you visited, music, movies you like, social network info, check-ins, interests you share) so you can instantly engage in mutually interesting conversations. Bottom line, it's been a fun ride so far and we're only a month into it. Free to use, the app is available now for iPhone (except iOS6) and alive and ticking for the Android as well. Support for iOS6, other platforms and mobile devices are also coming later this year. So, give it a try. Don't die a slow death in a mountain of business cards like poor Matt Marshall here! Everyone has their limits. Below is a video shot by Jean Baptiste Su of their demo presentation. See my earlier write-up on inTooch on the day of launch. And, refer to my two write-ups on Demo, 8 cool commerce apps and my DEMO photo summary. Photo Credits: photo at GigaOm taken by Carla Schlemminger and all other photos by Renee Blodgett. For those of you who go to a lot of conferences and events like I do, collecting business cards, exchanging data and keeping in touch with people after the fact is a daunting task. Sure, there are apps who have promised to faciliate the exchange of information in the past, but most require both people to have the app installed or the need to work in some unnatural and awkward way. And, then there's card scanners. I've invested in three over the years and two of the three ended up in a yard sale not so long ago. The other one I donated to Goodwill. Bottom line, they're not accurate so you're stuck stuck fixing all the mistakes or retyping the contact info into your database for the second and third time. I recently started working with a French-founded start-up called InTooch who is now based in Silicon Valley. InTooch is a mobile application that allows you to instantly turn people you meet into personal and business relationships that matter. Selected to present their technological innovation with over 75 other companies on the DEMO Fall stage this week, their demo will be included in the social media category. Did you realize that of all the people you meet at a conference or even in a personal situation, you won't stay in touch with 85% of them? InTooch aims to not just decrease that number but improve those relationships using their app. The great thing about the product is that it's easy, it's fast and it's free. Instantly, the moment you meet, the InTooch social connector exchanges contact information and connects you on your preferred social networks on the fly. While many apps have tried to solve the contact update and data overload problem, most require both people to have the app installed for it to work, or they involve connecting in an awkward way. In doing research about how people around the world stay connected, they discovered that the majority call each other to exchange numbers in real time more than they connect on social networks and exchange a business cards. InTooch takes it a step further by allowing people to share more than just numbers in real time, including your social data. Whenever you meet someone you want to stay in touch with, simply call their cell. The app detects that you have called someone for the first time and prompts you automatically to exchange your business or personal contact information. Works on Any Receiving Device: you can send and receive new contact information regardless of what phone the other person has. If the other person doesn’t have InTooch, it simply sends a link and the rest is done seamlessly through their social connector technology. Social Network Integration: In just one call, you can connect through LinkedIn, Facebook and Twitter. There’s no need to search for a contact in each social network nor to send invitations – connections are simply established on the fly. No Need for Both Parties to Have the App: unlike so many solutions which require both parties to have the app installed to work, InTooch works regardless of whether the person you just met has it on their phone, making it the most natural, straight forward and easy way to share your personal or business details. Obviously if the other person has the app, exchanging data is even faster. New Connection Highlights and Personal Match Score: For personal encounters, InTooch brings augmented reality to your connections, alerting you to all the things you have in common with another person (friends, places you visited, music, movies you like, social network info, check-ins, interests you share) so you can instantly engage in mutually interesting conversations. It also provides a matching score based on an algorithm which calculates the probability of how well you should get along with that person. Geo-Tagging of New Connections: since it’s much easier to remember where and when you met someone than his/her name, InTooch automatically tags the location of the initial connection, so you also can search for people by when and where you met them. Privacy (Control What Data Your Share): InTooch respects your privacy, allowing you to customize what information you want to share and with whom. InTooch is available for download at http://www.intooch.com and is free for users. Currently, InTooch works with both the Android and the iPhone (except for iOS6), with support for iOS6, other platforms and mobile devices coming later this year. You Want to Talk When? It’s happened to the best of us: we plan for months to get away from it all, leaving the laptop and the smartphone back home, while taking in the cliffs of the Grand Canyon, or the coves of Kauai. But, as you’re setting up your vacation auto-response with one foot out the door, an R&D team manager says they’ll be ready to present early next week, or your coworker explains that he just doesn’t feel comfortable dealing with a client on his own, or your CEO schedules a review at the exact moment of your tee time. For business professionals, taking off on a jaunt to some remote location is a fleeting reality when people in your business and personal life expect you to be connected all the time. MobileDay is a new app which launched earlier this month, which provides one-touch access to any conference call in North America, without the need to remember call-in numbers and access codes. It's great for connecting when you otherwise wouldn't or find difficult to. Need to discuss last month’s business plan with your boss from the top of Deer Valley? Want to review projections with your team from the scuba rental shop in West Palm Beach? Or, outline next steps with product development from the Victorian Grand’s porch at Mackinac Island? With MobileDay, you can handle this with ease on your smartphone, which surely you'll need for all the cool Geocaching you plan to do with your family on vacation anyway.